Frederick, Maryland’s In the Street Festival is an annual celebration of the arts featuring a variety of performers on four stages. The event is one of the largest in the area and encourages attendees of all ages to dance in the street. The festivities begin in the morning with the Market Street Mile, leading directly into the festival, ending with the Up the Creek Party featuring the popular high-energy dance music from 3AM Tokyo. 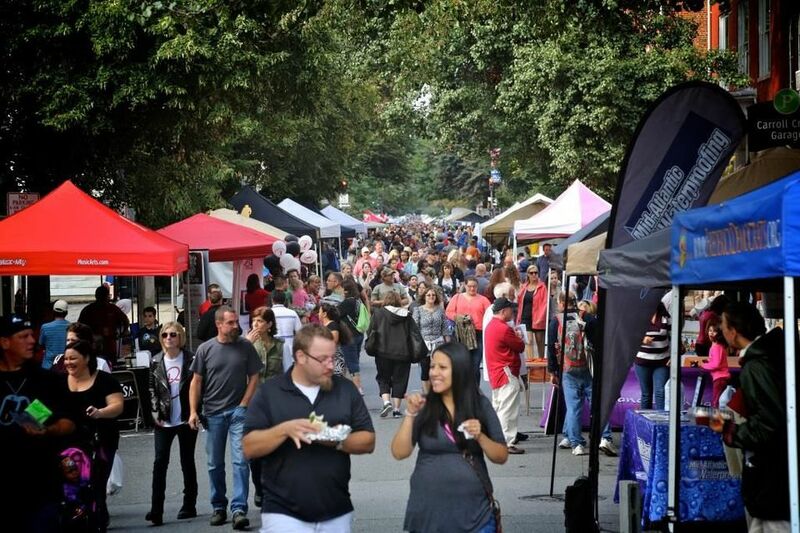 The street festival will also include a variety of food vendors, a family friendly beer and wine garden, a showcase a variety of art, jewelry and crafts from local artisans, yoga, Pilates and gymnastics demonstrations, trivia games, belly dancing performances, carnival games, balloon art and much more. Market Street Mile - 8:45 a.m. In the Street Festival - 11 a.m. – 5 p.m.
Up the Creek After Party – 5-9 p.m. Located about an hour northwest of Washington, DC, Downtown Frederick is accessible from I-70, I-270, US 15, and US 40. Parking: The City of Frederick has five convenient parking decks downtown. The Carroll Creek, Court Street, W. Patrick Street, E. All Saints Street and Church Street parking decks all offer parking in close proximity to the event. Cost is $6 to park all day. The one-mile run down Market Street features various heats including Women’s Mile, Men’s Mile, Family Mile, and more. Pre-registration is recommended. Day-of registration begins at 7:30 am at the Frederick YMCA. Proceeds benefit the Panther’s Running Club at Lincoln Elementary School. NOON to 1 PM – Cheshi (Indie Rock) - Cheshi sings about the trials and tribulations of life and the realistic darkness that exists in the world we live in. Through Cheshi’s music, controversial ideas are brought to light to provoke change within oneself. .
1:30 to 2:45 PM – Heavy Lights (Indie) -Originating in Frederick County, Heavy Lights delivers an indie-pop rock sound that has been influenced by 90s rock. Their music, based around bass and drums, is sure to entertain and get you nodding along to their playful songs! 3:15 to 4:30 PM – Guys In Thin Ties (80s) - The alternative 80s rock cover band is driven to entertain the audience with some of the best songs from the MTV Music Videos era. Come out with Bill (bass and vocals), Mark (guitars and vocals), Dave (drums), Jim (keys, guitars and vocals) and John (vocals) to get your 80s on! 5 to 6:15 PM –The Ted Garber Band (Blues Americana) - Ted Garber, a genre-bending multi-instrumentalist, introduces a new golden age of live entertainment called “BluesAmericanaRock,” which combines classic showmanship with a captivating singer-songwriter sensibility. 7 to 9 PM – 3AM Tokyo (Dance) -3 AM is a high energy mix of electronic dance, pop, dubstep, and rock that keeps their audiences dancing all night. 11:30 to 12:30 PM – Jessie Chris - Chris at 18 years old was the youngest performer at the CMA Festival and has opened for iconic artist to include Luke Bryan, Chris Young, John Rich and Billy Ray Cyrus and has performed at The Country Music Hall of Fame. 1:15 to 2:30 PM – SaraBeth - Earning fans one show at a time, landing considerable regional media exposure, scoring two nationally charted singles, developing a base in her native Texas, expanding it nationally and even internationally with a successful U.K. tour in 2014. 3:15 to 4:45 PM – Olivia Lane - If there’s one thing that stands out about Olivia Lane, it’s her pure, unbridled energy. It’s reflected in her big, dynamic voice; in her performance, which bursts with passion and levity; and by her simple presence, which can dissolve you in laughter and make you grin from ear to ear. 11 AM to NOON – 8 Ohms Band (Funk) -Up and coming band, the 8 Ohms Band plays horn heavy funk/soul with a blend of R&B and Go-Go music throughout Maryland, Virginia, Delaware, Washington, DC, and West Virginia. 12:30 to 1:30 PM – 9 Miles Roots (Roots/Reggae) - Based out of the Baltimore/DC metro area, 9 Miles Roots is a suburban roots-reggae band featuring a talented group of musicians from diverse music backgrounds. 9 Miles Roots delivers creative music with a strong reggae vibe, bouncy hip-hop flow and a rock edge. 2 to 3 pm – Silent Old Mountains (Indie Rock) - The band blends indie rock, folk and poetry to create a unique style all their own, which has earned the band a quick and loyal following. 3:30 to 5 PM – Ghost Pepper (Party Rock) - Ghost Pepper is a high-energy cover rock band from Frederick, MD. With influences from classic 70s rock, 80s glam, and hits from the 90s to today. 11AM to NOON – Market Street Big Band (Swing) -The band can enhance any occasion with music reminiscent of the traditional sound of the famous Big Band era featuring jazz, swing and Latin tunes. 12:30 to 1:30 PM – The VooDoo Blues (New Orleans Funk) - The quartet consists of Ryan Benton (piano, Dave Clements (bass), Travis Driver (drums), and Scott Pardue (harmonica). The band plays funk and blues influenced by Southern Rock and love to give their audiences a “hand-clappin’” good time! 2 to 3 PM – Katie Powderly & The Unconditional Lovers (Americana) - Katie Powderly is a confident singer, songwriter who isn’t afraid of telling the truth! Her back up band, The Unconditional Lovers, is made up of Kevin Etzler, Colin Shultzaberger, Neil Durr, Mike Brock and Evan Durr. Together they create a fringe folk sound that audiences adore! 3:30 to 5 PM – Higher Hands (Funk/Soul) -Higher Hands has a funk sound that combines fusion, hip-hop, afrobeat, and DC Go Go music. The band has established itself throughout the DMV for having a tight set.